While building a full-fledged branch college of the University of Virginia in Northern Virginia might take several years and a good deal of political wrangling (as indeed it did), the quickest and easiest way for the University to gain an initial foothold in the area would be to establish an extension center. Such a center would have an emphasis on adult education and be aimed at returning veterans and other Northern Virginians who wished or needed to enroll in college-level instruction. Once the center was established and serving local citizens, the case could then be made that the University should take the next step--with the help of the Virginia General Assembly, of course. To that end, the Universityof Virginia’s Director of the Extension Division, George B. Zehmer, sent John Norville Gibson Finley, a faculty member in the Extension Division, up to Northern Virginia to begin this effort. An organizational meeting for the extension center was held on January 5, 1949, at Washington & Lee High School in Arlington. 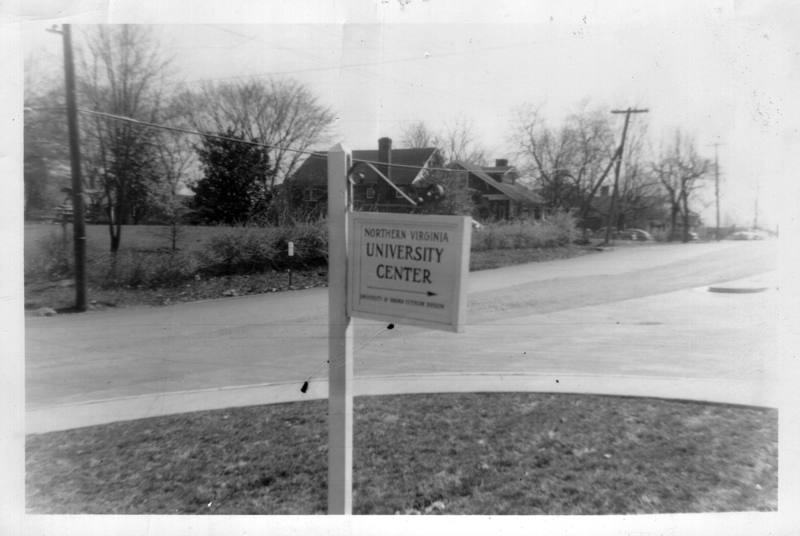 To reinforce the idea that Northern Virginians wanted the University to start an extension center in the area, Clarence Steele, appointed head of an eight-person exploratory committee on the center by Mann, wrote a letter to President Darden dated April 4, 1949, officially requesting that the University establish an extension center to serve the local population. The local committee, whose members hailed from each of the four major municipalities, and representatives from the University would meet several times during 1949 to formulate plans for setting up an extension program in northern Virginia. Because it might take some time to get a free-standing extension center in place in Northern Virginia, the Extension Division, working with the local exploratory committee, investigated temporary locations that could house the administrative aspects of the program, as well as offer some classroom space. Washington & Lee High School, located at the intersection of Quincy and North Stafford Streets in Arlington, offered to help. Built in 1924, it served as the only high school for area students for decades. The high school had plenty of space to offer when the University of Virginia needed to operate a small extension center in the evenings after the school day ended. An early 20th century house, which stood on the campus and belonged to the high school, served as the Center’s office and first classrooms. Washington & Lee also offered the Center several classrooms inside the school and its library. The committee members were well acquainted with W&L, as it was the venue for most of their planning meetings. With Finley at the helm as Director, UVA’s Northern Virginia University Center was officially open for business on October 1, 1949. The Center spent its first year organizing, hiring faculty, and developing a curriculum. Organized classes began during the winter of 1950, and both credit and non-credit enrichment courses were offered. All classes were offered in the evening because of classroom availability. The first semester offered non-credit courses in public speaking, conference leadership, introductory electronics, literature of the Bible, local planning and zoning administration, and rapid reading. The for-credit courses included money and banking, accounting, several education courses, refresher courses for architects, and several engineering and mathematics courses. Theoretically, students of the Extension Center could complete two years of college classes at the Extension Center that could be transferred to the University or other colleges. But, by 1954, due to changes in accreditation requirements, that scenario would no longer be possible. Browse other items related to the Northern Virginia University Center. Northern Virginia University Center 1950-1951, William Hugh McFarlane George Mason University History Collection, 1950, Box 1, Folder 1.8. John Norville Gibson Finley, "Progress Report of the Northern Virginia University Center", July 1, 1952. George Mason University Archive Facilities and Planning 1953-1972, Box 1, George Mason University A Profile History, Folder 1.1.